This image was created with the hand held Canon 400mm f/4 IS DO lens and the EOS-1D Mark IV. ISO 800. Evaluative metering +1/3 stop: 1/800 sec. at f/5 in tv mode. When working on a boat or in other situations that require a minimum shutter speed I will often choose to work in Tv Mode and dial in the required exposure compensation. 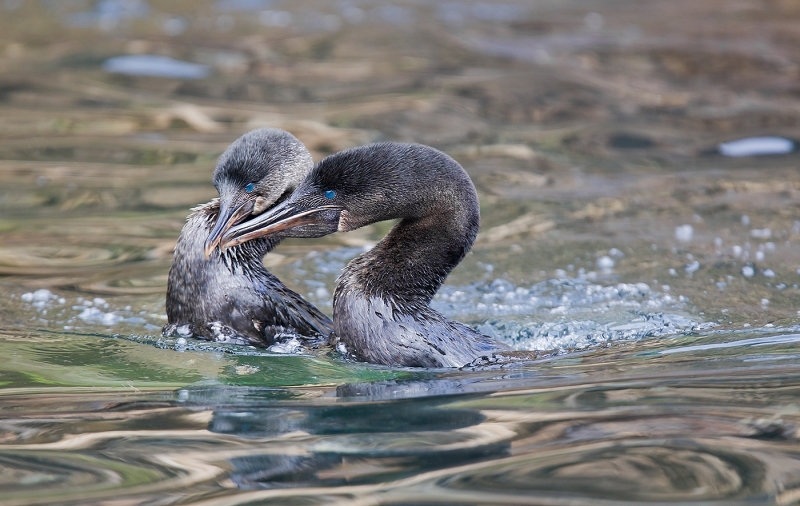 The image above of Flightless Cormorants performing their aquatic courtship/mating dance was photographed from a panga (Zodiac) on the 2010 Galapagos Photo-Cruise of a Lifetime. It is presented here for your critique; feel free to praise it or rip it to shreds. Would you keep it or delete it? Let us know why either way, what you like or what you hate. What would you have done differently? Over the course of the next two weeks I will present three additional images in this series for a total of twenty in all. The last will be followed by several revelations including two major ones. Do consider joining us in July 2013 in the Galapagos; it may very well be my last trip down there…. The GALAPAGOS Photo Cruise of a Lifetime IPT/The Complete Galapagos Photographic Experience: 13 FULL and two 1/2 days of photography: $12,749. Limit 13/Openings: 5. July 2-16, 2013 on the boat. Fly to Quito on June 30. Travel insurance day: July 1. Fly to the archipelago on July 2. Get off the boat on July 16. Spend that afternoon and evening in Puerto Ayora (lunch & dinner on your own). Fly to Quito on July 17. Fly home on the early morning of July 18. Non-refundable deposit: $5,000. Briefly, my two-week trips are without equal. The world’s best guide, a killer itinerary, a great boat (the Samba), and the best leader with seven Galapagos cruises under his belt. The great spots include Tower Island (including Prince Phillips Steps and Darwin Bay), Hood Island (including Punta Suarez, the world’s only nesting site of Waved Albatross, and Gardner Bay)—each of the preceding are world class wildlife photography designations that rank right up there with Antarctica, Africa, and Midway), Fernandina, Peurto Ayora for the tortoises, Puerto Egas—James Bay, North Seymour, South Plaza, Black Turtle Cove, Floreana, Urbina Bay, and China Hat. Plus tons more. And lots of snorkeling for those who wish to partake. All park fees, meals except as noted above, guide fees, ground transportation, and the flights to and from the Galapagos are included. Click here for information on all BAA IPTs. Canon 400mm f/4 IS DO lens. I missed this versatile lens so much on last year’s trip that I will surely borrow one for my 2013 trip; it is unsurpassed for panga (Zodiac) photography. This comp shows the water movement created by the birds and the direction of movement. Also if you moved the birds to the right you would cut off the water feature.This comp also focus my eyes immediately on the birds and then I am drawn to the right along the water trail. I can’t see any reason to change the position of the birds. The wave flow seems to fall from the right on down, which puts the birds in the lower left. I personally don’t get the notion that moving objects need to have a place to move to. No they don’t. That can be left to the imagination. And having movement towards the edge of the frame actually creates a sense that something is moving, particularly in a shot like this where a fast shutter speed has been used in order to freeze the actual movement. Hi, I like it and would keep it with a little adjustment: making the image a little bit darker (its too light for my taste) and I would crop to exclude the light spot on the right but keep most of the small waves behind the birds. That would almost center the birds but that I would like in this case. Of couse it’s a keeper. My preference would be for the birds to be shifted towards the right hand side of the image giving them a little more space to move towards. This would cause you to either lose some of the movement in the water, or would have required you to have framed the shot differently. Assuming you didn’t crop the image, it may not have been possible with 400mm lens, and I could see why you would not want to lose the movement in the water. Neat interaction of the to subjects. Composition is correct, as noted in Jeanette Bennett’s comment. A keeper for sure!! This doesn’t quite work compositionally for me either. Just like with head angles, there’s a de facto “rule” that images are more balanced and aesthetically appealing if the subject have space to move into: I certainly feel that this image – good as it is is – would be improved if (say) some canvas was added to the left side of the image, and maybe cropped from the right side. Wonderful shot. Don’t change balance. Your bubbling water was caused by the bodies just below the surface. That water turmoil is clearer on the right. Although their bills face to left, we know they really are not focusing on anything other than each other. Law of thirds is not forgotten here. Good job!!! I would be thrilled to have captured the birds interacting so well and beiong able to see both faces. Its a keeper in my book. I would have framed it the way you did, Artie, because the birds are moving from right to left and the wakes behind the birds show this movement and make the composition please me the way it is. I like this image, but feel the subjects should be positioned more to the right. They seem to be crowding the left edge of the composure. Great shot technically, but perhaps the composition is a little unbalanced? A little more space on the left, and a little less space on the right? I can’t see a thing not to like in this one. Might wish for a tad more DOF for the left-hand bird, but the eye looks sharp, and the behavior is wonderful. I love the smooth water swirls in front, not so sure about the light patches (snow?) in the BG. It’s just a gorgeous shot all around.